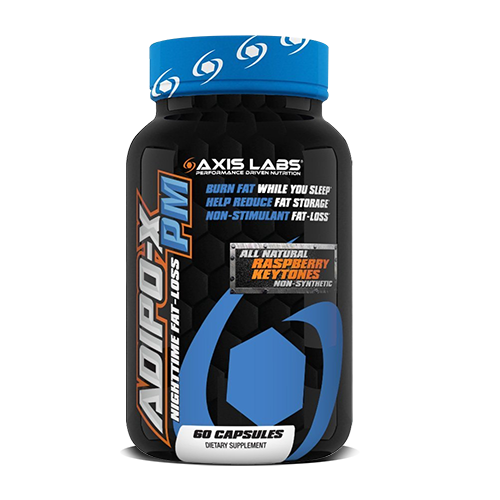 Get A Free Axis Labs Adipo-X PM On Purchase! Seriously, you can have it all with Axis Labs’ innovative high-potency thermogenic, SYNTHALEAN. An advanced fat-loss technology, SYNTHALEAN is a body fat burning, weight loss jackhammer. The cutting edge burn supplement works synergistically to optimize your fat-burn naturally without energy crashes, jitters, and other unwelcome side effects. This unique blend of branded ingredients, backed by human research clinical studies … comes together in a ground breaking, FAT INCINERATING, ENERGY GENERATING, FOCUS INDUCING CAPSULE. Body Fat burning comes from tipping the formula of physical activity to calorie intake. Ultimately, burning more calories than you consume combined with your resting metabolic rate (the amount of calories you expend without exercise) results in rapid and managed weight loss that has lasting results. Over caffeinated products by themselves isn‘t the answer. Too much caffeine causes jitters, the dreadful crash, and grogginess. SYNTHALEAN: is formulated with multiple natural stimulants that peaks at different times and gradually subsides so there’s no crash, jitters, or grogginess. SYNTHALEAN: is strong. As a thermogenic, it boosts temperature and energy to literally melt fat. You can feel this fast-acting body fat burning supplement working. SYNTHALEAN: this potent fat-incinerating product works by combining the latest science has to offer to provide you with the greatest fat burning capacity. In development for over two years in countless versions, SYNTHALEAN improved alongside the ingredients and science. Our high-tech formulators used the best ingredients and scientifically formulated the synergy among the ingredients to create an incredible supplement to take for weight loss. Not only are we bringing you new, patented ingredients, but more importantly, ingredients that are safe and have been researched to work alone and together with some of the formulations other ingredients to allow for ultimate synergy and weight loss. It is super strength condensed into just one capsule! Harsh stimulants and aggressive burn supplements are not required to stimulate body fat reduction. In fact, aggressive and high amounts of caffeine can unnecessarily tax your nervous system and leave you restless at night. Disturbances to sleep, mood, and focus are the opposite of what you need to optimize your body composition. No more peaks and valleys. Ups and downs. Jitters and shivers. Being alert one minute and then crashing and anxious the next. SYNTHALEAN is precision formulated to provide boundless energy that feels good and tapers gently to avoid crashing energy. With SYNTHALEAN, you can stay alert and awake, as well as burn fat all day long. Axis Labs has been providing unique and premium formulations for over 10 years. The makers of N’GAGE, HYPERTEST and HemodrauliX, Axis Labs is committed to the best ingredients in efficacious doses to provide superior quality of products for all your body fat burning supplementation needs. We have the willpower. We have the innovation. We have the next generation secret that will allow you to break through and break free of excess fat. Enough is enough: It’s time for you to look in that mirror and be happy with what you see. No need to keep feeling “over stimmed” without results. Be alert, in the zone, and at your best. Lose the ceaseless hunger pangs. Metabolism optimized. Brain optimized. The best fat incinerator in the world period… in one capsule. Evolve past stimulants to the new and improved YOU with this revolutionary weight reduction supplement. Are you ready to change? Are you ready to look into the mirror and smile from ear to ear, filled with enthusiasm because of the battles and barriers you have overcome? L-TeaCrine: L-Theanine, when combined with Teacrine and caffeine, provides the ultimate combination. L Theanine will reduce the excitability caused by caffeine while retaining the focus and attention span benefits that caffeine provides. Not only does L-Theanine prevent from the “over-stimmed” conundrum, but research also suggests it can improve mental recovery after physical stress (i.e. working out) and cognitive performance. L-theanine, a branched-chain amino acid found in green tea leaves, has been linked to reducing mental stress and has relaxing effects without causing drowsiness (Juneja 1999). Caffeine: Caffeine, in combination with the aforementioned ingredients will really spice up this formula. Several studies have shown significant increases in intramuscular fat oxidation during exercise when caffeine was given prior to the bout. Caffeine combined with L-theanine and Teacrine create the ultimate trio of a balanced stimulant, fat oxidation, and clean energy feel. N-Acetyl Tyrosine: Tyrosine is the precursor of the catecholamine (CA), neurotransmitters dopamine (DA), norepinephrine (NE), and epinephrine. Tyrosine may preserve arousal during exercise and allow for prolonged and enhanced performance. While caffeine appears to improve focus and performance during typical activities, tyrosine appears to enhance performance when acute stress degrades function (such as when dieting or intense situations), thus making a great synergistic combination with enhanced body fat burning properties. White Willow Bark: White willow bark and its active constituent, salicin, display pain relieving effects. White willow bark appears to inhibit pro-inflammatory cytokines and reactive oxygen species to help you recover and feel better. When combined with caffeine, white willow bark can enhance weight loss and improve lipid profiles (cholesterol and triglycerides) while improving mood and focus, making this a powerful part of this weight loss supplement. N-Methyl Tyramine: N-methyltyramine is provides focus and energy enhancement, while enhancing mood to provide you with a “zoned in” euphoric feel. Stack SYNTAHLEAN with ADIPO-X PM in the evening for 24-hour burning. Manufactured to the highest standard, ADIPO-X PM fuels fat loss while you sleep without interrupting your sleep!